A person feeds a dog, gives him a home, and makes sure he is healthy. The dog thinks, "Wow. That person must be a god." A person feeds a cat, gives her a home,and makes sure she is healthy. The cat thinks, "Wow. I must be a god." 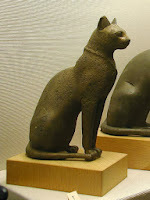 Ancient Egyptians worshipped the cat-god Bastet. Greeks and Romans didn't worship their cats, but they brought them with the Imperial Legions as far north as Britain. They valued their pets as symbols of liberty. 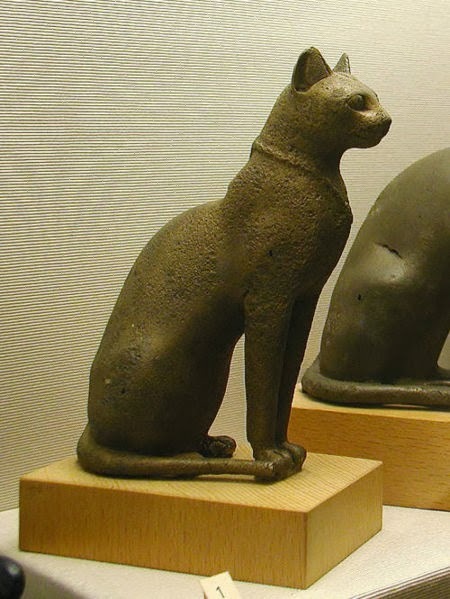 Cats probably were domesticated before Egypt. Unlike dogs, cattle, sheep, and other domesticated species, people didn't seek out cats for their obvious uses. And cats, with their solitary and independent ways, didn't look to humans as their new leaders. But civilization brought with it food storage, a rise in the rodent population. First cats followed their source of food and then convinced humans of their importance for rat control and companionship. Cats have gifted me with an occasional mouse or bird, but I have never lived on a farm. Most of modern America has little need for rat-catchers. That talent, however, meant a great deal to people of the past history. For instance, they helped in the fight against the Black Plague. Cats came to America across the Bering Strait, on the Mayflower, with Christopher Columbus--but not enough to take care of the burgeoning rodent population. Where people didn't bring cats, they ended shipping them in. During the Gold Rush, as much as $50,000 was rumored as the price for a cat. Records of $100 per cat exist in 1884 San Francisco. America served as a "melting pot" for our cat population, resulting in a purely American breed, the "domestic shorthaired." We'll end with a nod to famous cats: President Clinton's "first cat," named Socks. Written by Darlene Franklin. Waving hi! I to love cats. They sure can wind their way into our hearts. Love this, Darlene. Our cat has one orange foot, and I'm sure she thinks that entitles her to adoration. Interested to read that cats came to the US on the Mayflower. They must have kept the mouse population down on the ship. Interesting post. I'm am unashamedly a dog person but know lots of friends with kitty furballs and lots of cute/fun stories about them. Great post, Darlene!